23 April: Not a mere generous impulse; Browning V.
Here is Elizabeth Barrett, writing to Robert Browning a few months before the extract in our last post. I thought too, at first, that the feeling on your part was a mere generous impulse, likely to expend itself in a week perhaps. from “The Letters of Robert Browning and Elizabeth Barrett Barrett, Vol. 1 (of 2) 1845-1846″ by Robert Browning, available on Kindle and online. It can be hard to accept that we are loved, whether by God or another human being. Surely we have experienced those ‘mere generous impulses’ which come to nothing but scratch a few scars on the heart in the process. Jesus – in this world, in his time – stayed long enough to reassure his disciples that their friendship was dear to him to the last. And while Peter (the past master of generous impulses) may always have regretted his share in the events of that spring, he received the grace to feed the Lord’s sheep and be faithful to the last. The clasped hands of Robert and Elizabeth Barrett Browning, cast by Harriet Hosmer, Metropolitan Museum of Art. This file is made available under the Creative Commons CC0 1.0 Universal Public Domain Dedication. 21 April. Stations of the Cross for Saint Peter: XV, Easter Sunday. Easter tomb, Canterbury Cathedral, MMB. Scripture references: Empty Tomb: John 20: 1-19; Barbecue by the lake and Jesus’ questions to Peter: John 21: 1-23. I ran to the tomb, I saw the cloths that his body had been wrapped in. I believed! Then Jesus came to find us. He cooked a barbecue by the lake – as normal as anything. He asked me: Do you love me? Yes Lord, you know I love you! Let us pray for the courage that comes when we know God loves us, and we dare to believe that we love him. May we know the good food to give his sheep. 28 March. Before the Cross XIV, Conform me to your likeness, Lord. It’s always a joy to receive a post from Christina Chase. Here is her contribution to our season of reflections ‘Before the Cross’. Conform me to your likeness, Lord. unless they’re open wide in love. into the power of love. Conform me to your likeness, Lord! limbs immobile, lungs slowly failing. and I will be able to go every where that you are. 23 March. Before the Cross X: Christ crucified welcomes us. As a teenager I visited the resort of Tignes in France on a family skiing holiday. On our way through the French Alps from the airport, our coach crossed a dam, and we could see a large reservoir stretching up the valley to our left. Our ski rep began to tell us a story. There had been a village known as Tignes, which had been flooded and destroyed with the creation of the reservoir in 1952, and its people had been relocated to a newly built village, Tignes Les Boisses. The church there, l’église Saint Jacques de Tarentaise, had been built to a design similar to that in “Old Tignes”. All this is verifiable history. The road wound uphill, away from the dam, and we entered the purpose-built village. Our rep related how an elderly couple, objecting to the flooding of their valley, and ignoring all the remonstrances of the EDF and local authority negotiators, had refused steadfastly to leave their home. They had drowned as the waters rose to form the new reservoir. He told us to look to our right as we drove past the church, and to notice the crucifix in front of it. 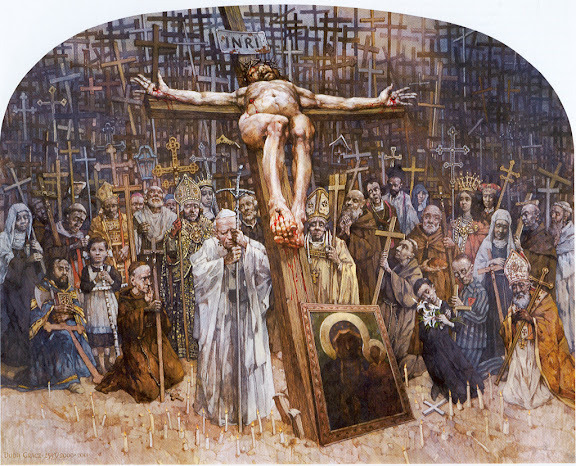 The arms of Jesus had originally been nailed to the crossbeam, he said, but over the years they had dropped down to their present position, as though Jesus himself were pleading on behalf of the drowned couple. There was no scientific explanation for this extraordinary phenomenon (great solemnity and wonderment in his voice at this point); not even in the natural warping properties of wood. The image of this cross has remained with me through my adult life, and I have retold the story of it more than once, and with equal solemnity. But I recently discovered that it wasn’t true at all. At least, I have found no evidence that the elderly couple ever existed. The crucifix itself was crafted by Jean Touret for the new church, with the arms of Jesus extended downwards in an expression of grief for the loss of the old village. It was also to represent Jesus’s welcome of visitors. He named the work ” le Christ Accueillant ” – The Welcoming Christ. I would rather our ski rep had told us the truth surrounding this remarkable crucifix. Perhaps he believed his story. Or perhaps venturing into the “religious” subject of Christ’s welcome made him feel uncomfortable. As in so many movies, here was an invented tale designed to make is feel indignant towards big-business callousness and government collusion. And our sense of moral outrage is validated by the direct involvement of God himself. No harm in that, surely? Jean Touret had wanted to honour a community genuinely affected by trauma and loss. His purpose had not been to elicit indignation, but to recognise that Christ stands with the broken and dispossessed. And nobody is honoured by fabricated miracle stories, least of all Jesus. The Hollywood approach fundamentally misreads what is meant in the gospels by the Kingdom of God. It would direct our disdain towards world powers and social injustices over which we have very little control. It would have us “rage against the machine” much like the zealots in Jesus’s own day. To the question, “What’s wrong with the world?” GK Chesterton’s famous answer was “I am”. The challenge of the gospel is to grasp our own need for a saviour, and in love (rather than self-righteous indignation), to consider the world’s need for a saviour too. “Le Christ Accueillant” does indeed signify a miracle: that Jesus welcomes us today into the presence of the Loving Father. Not from the cross, but as a resurrected, living Saviour, whose brutal crucifixion made our rescue and welcome possible. Thank you, Rupert, for another thought-provoking image and prayerful reflection. WT.